Kamloops Lake, from its south western end. The fort would have been where the plume of smoke rises. In 1846, Anderson and his men rode over the hills pictured here, making their way to the mouth of Thompson’s River where it left the lake. The outgoing New Caledonia brigade left Fort Alexandria on May 2, 1846. This year, clerk Alexander Caulfield Anderson traveled out with them. 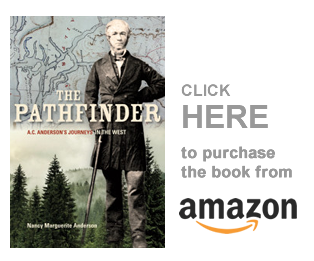 From Kamloops, Anderson planned to explore for a new brigade trail that would connect that Thompson River post to Fort Langley, on the lower Fraser River. 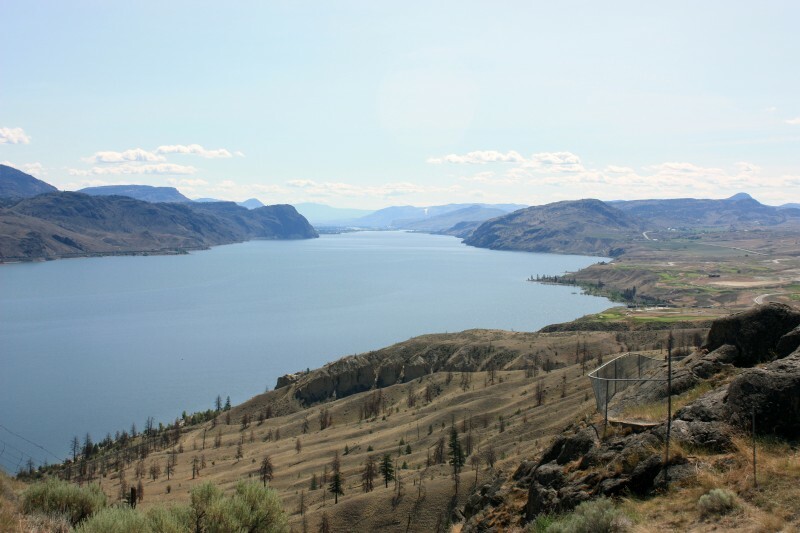 Confident that he could find a good horse road between the two posts, Anderson led his men along the south shore of Kamloops Lake and crossed the Thompson River, to follow it west along its north bank. With some difficulty the party crossed both Deadman and Bonaparte Rivers, and followed Hat Creek West through Marble Canyon. So far, this was familiar territory. The trail that Anderson and his men followed was the route by which the salmon were delivered to Kamloops every summer. Anderson arrived on the banks of the Fraser River and set up camp near the Fountain village, where the natives fished for salmon every summer. South of this fishing village, the Fraser River flowed into a steep-sided and broken river trench, and in the distance loomed massive Fountain Ridge. The proposed track passed down this rugged river bank and over Fountain Ridge, but Anderson could see it was impossible to take horses through this broken land. On the morning of May 20, the exploring party crossed the Fraser River in canoes borrowed from the natives, and walked down the west bank of the river as it curved around the end of Fountain Ridge. They crossed the mouth of Bridge River by the native bridge that existed there for many years. After a ten-mile hike down the rugged river bank, they arrived at the mouth of the river the natives called Pap-shil-qua-ka-meen. This rapid-filled river (now Seton River) tumbled downhill from two isolated bodies of water that wound between high mountain peaks. Seton Lake, from the top of the mountain ridge north of the lake. Anderson’s party walked along the north or left shore, toward the camera from the place where Seton River flowed east into the Fraser. From the east end of the first lake — today’s Seton Lake — Anderson’s party walked the lake’s north shore toward the strip of land that separated the two lakes. The twelve-mile long lake curved between precipitously sloping mountains that reached a thousand feet into the air, and Anderson saw that the tops of the ridges were white with snow. He knew that a trail could never be built over this route, that could be traversed by the two hundred horses of the typical brigade. Still, boats were another possibility, and they were half-way to Fort Langley with no alternate route. A ripe strawberry was picked here this evening. But the background is the most rugged and dreary-looking tract I ever met with; nor had I any previous conception that so mountainous a region could exist so near the banks of a large stream like Fraser’s River. 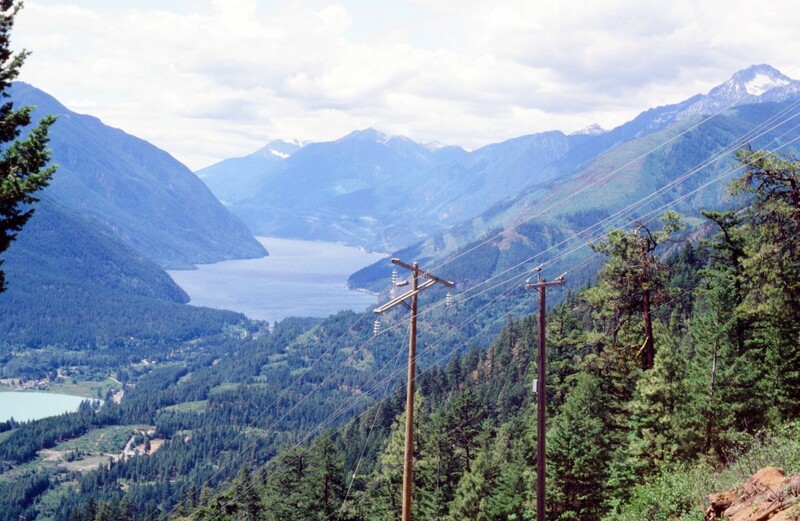 Here we see the west end of Seton Lake and Birkenhead (now Seton) portage. Beyond lies Anderson Lake, named in 1858 by Alexander Caulfield Anderson for his family. At the end of Seton Lake, Anderson crossed over a wooded point of land to another lake, and walked a few more miles up its shoreline before stopping for breakfast. Years after he first visited this place, Anderson was asked to name these two lakes. He named Seton Lake and Birkenhead Portage [now Seton Portage] for his cousin and childhood playmate, Lieutenant-Colonel Alexander Seton of the 74th Highlanders, who, in 1852, drowned in the iron troopship Birkenhead off South Africa. I visited this place in 1993. 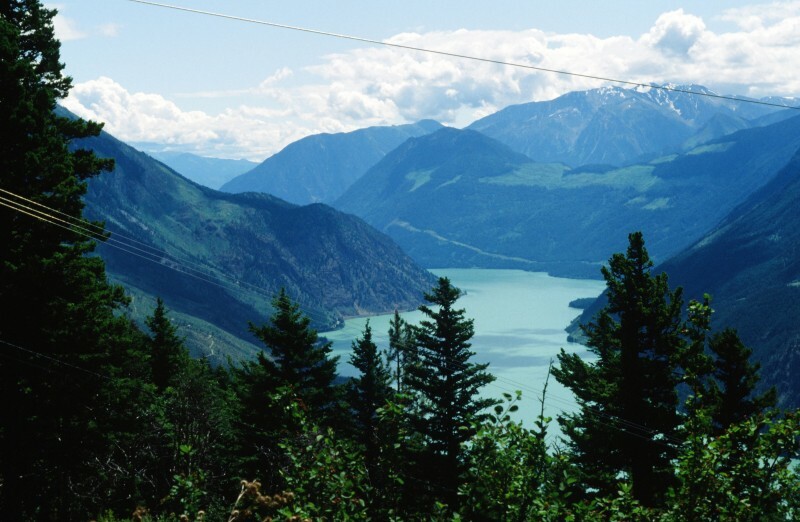 To get to Seton Lake and Portage from Lillooet, you cross the Fraser River and drive west toward Carpenter Lake, following the signs to Shalalth. The road will climb up a steep mountain ridge and down the mountain’s south slopes, to the shores of the Seton Lake — with many impressive switchbacks and some spectacular views! I spent a few hours exploring Shalalth. Then, as I drove up the hill that evening, a golden-beige bear tumbled down the steep slope and landed on the road directly in front of my car — a foot in front of the hood! He glanced at me with dark-rimmed Cleopatra eyes and kept on running. As he disappeared down the slope, the hood of a truck edged around the switchback ahead, with two men leaning forward to find the golden bear they had frightened. I also have some copies left to sell. My second book, with Working Title “York Factory Express,” is now in the hands of my editor, and I am beginning to write my third, which will look more closely at these explorations and the resulting brigade trails. This story will be a part of that book, too. These are very exciting times, and I am looking forward to my new project! So many good stories! Copyright, Nancy Marguerite Anderson, 2014. [Updated July 26, 2105]. All rights reserved.